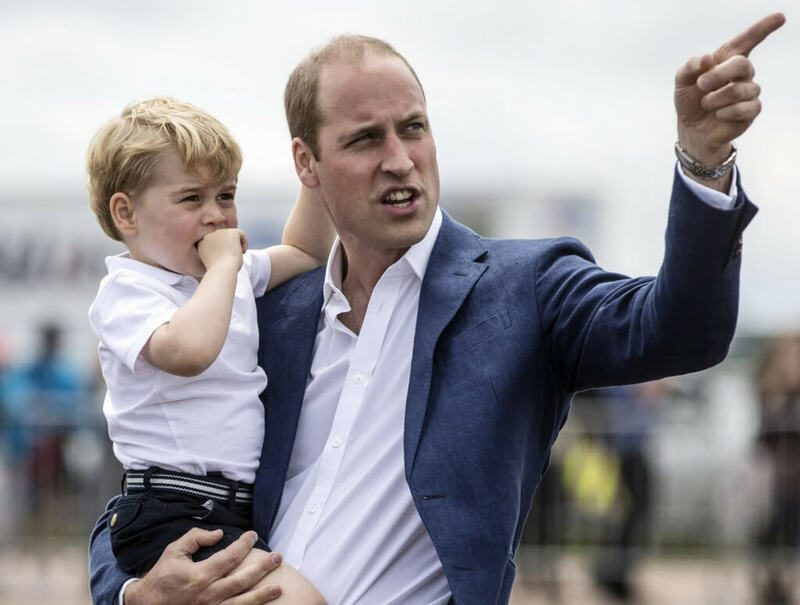 Prince William holds an important title as the Duke of Cambridge — but his most important title is Dad. 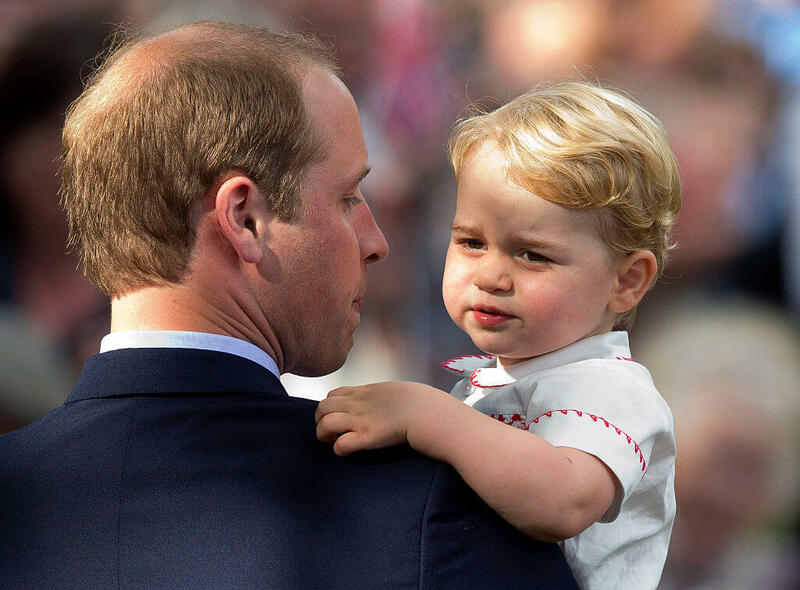 Since becoming a father in 2013, the world has been obsessed with Prince William’s sweetest moments with his son, George. Now, a half a decade and two more royal babies later, we still can’t get enough. 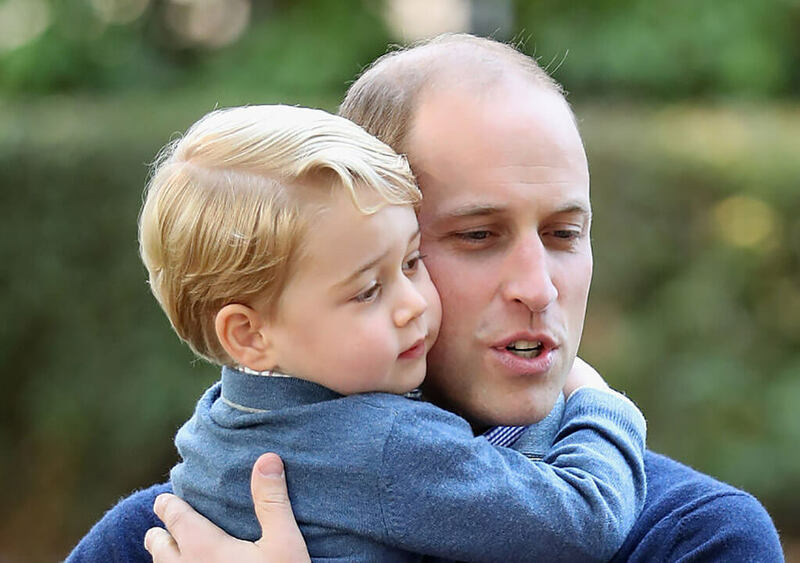 They may have been born into a royal family, but these tender moments of Prince William and George will remind you that at the end of they day, they’re more like us than we might think. Check out some of their sweetest father-son moments. 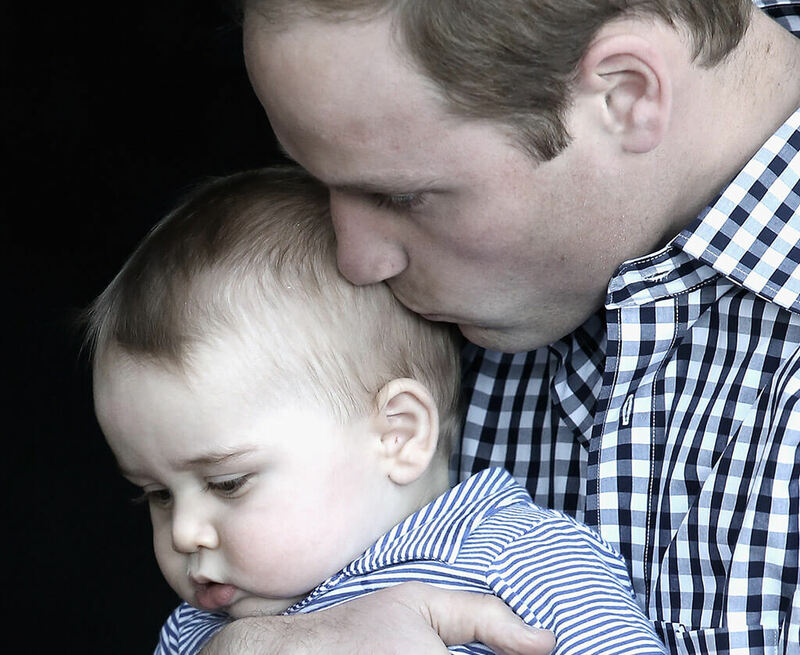 The tender moment Prince William shared with his son when he became a big brother warms our hearts! In June 2018, Prince William did something cool. The royal turned 36, but instead of celebrating his birthday in a traditional way, he spent his day helping others. He attended the opening of the Defense and National Rehabilitation Centre for injured members of the armed forces where he spoke about his work with the group. Not everyone gets to experience a helicopter ride in their lives, but it’s par for the course as a royal. Still, being around a helicopter and a specialty aircraft is exciting — especially for a young child. 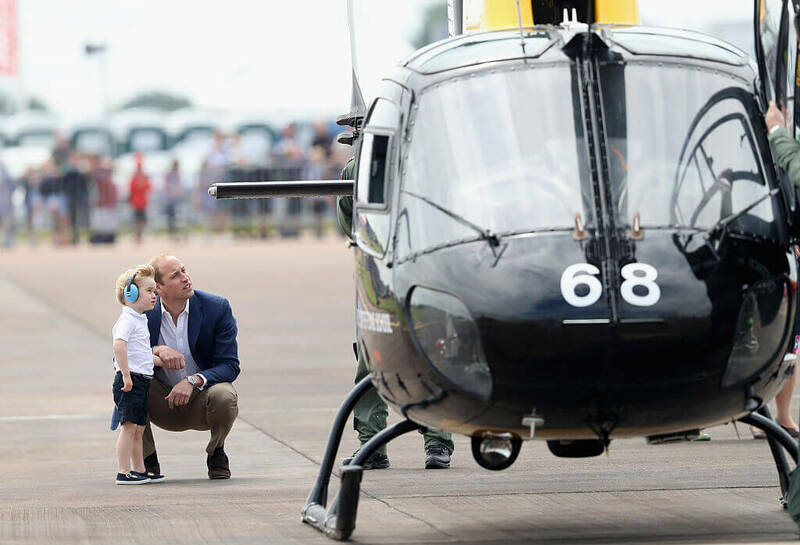 Here, Prince William kneels down beside George while the two look at a Squirrel helicopter during a visit to the Royal International Air Tattoo at RAF Fairford. By the look on George’s face, you can tell how in awe he is of the helicopter. You can also tell the sheer size and power of the aircraft is a little intimidating to him — check out how he is sweetly holding onto his dad’s hand! Society tells us that we should raise boys to be tough, so it’s extra sweet to see such a tender moment between a father and son. 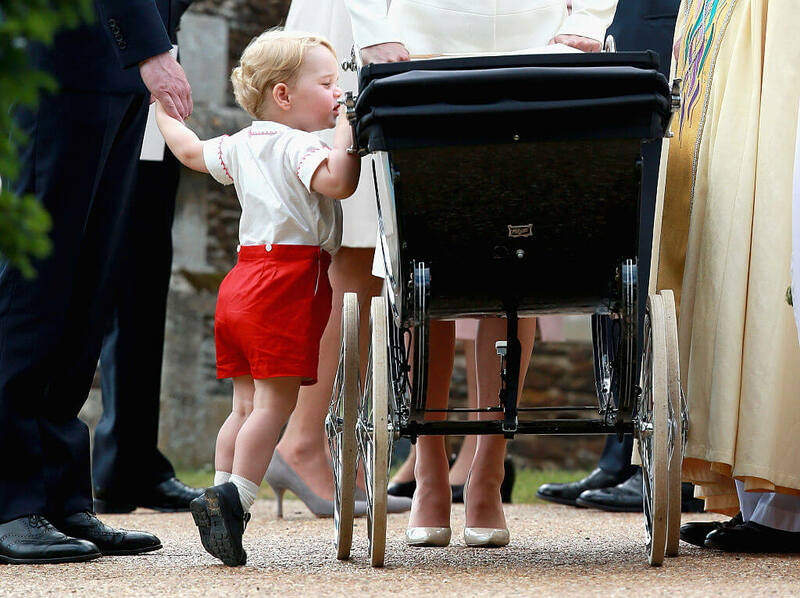 This adorable photo was snapped soon after Kate gave birth to Princess Charlotte. Becoming a big brother is exciting, but definitely a stressful event for a little one. No longer an only child, we’re sure Prince George had a lot to get used to once his little sister arrived! But it looks like dad did a great job comforting him. The best dads are the ones who are constantly exposing their kids to new, exciting things. The best dads are also those who support their children’s interests and help them reach their fullest potential. 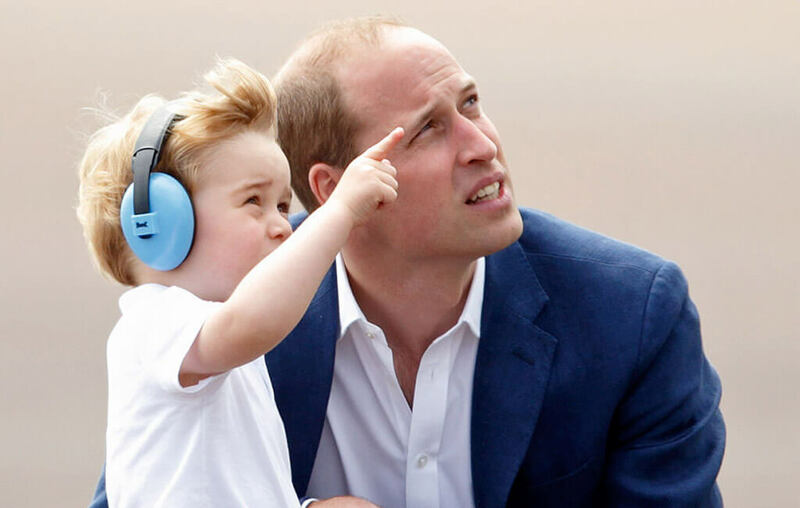 Maybe Prince George won’t grow up to be a pilot, but for now, the sky is the limit! And from the looks of it, his dad is supporting him along the way. The next photo might not be the “cutest,” but we love it because we all can relate to it. Alright, dads, how many of you can relate to this photo? We’ve all experienced our little ones having a breakdown in public. It’s just a part of life. And while breakdowns, tantrums, and kids behaving badly is something all parents deal with, it’s nice to be reminded we aren’t the only ones. Life isn’t always easy, even when you’re a royal. While this might not be the cutest photo of Prince William and Prince George, we think it’s sweet because it’s so relatable. 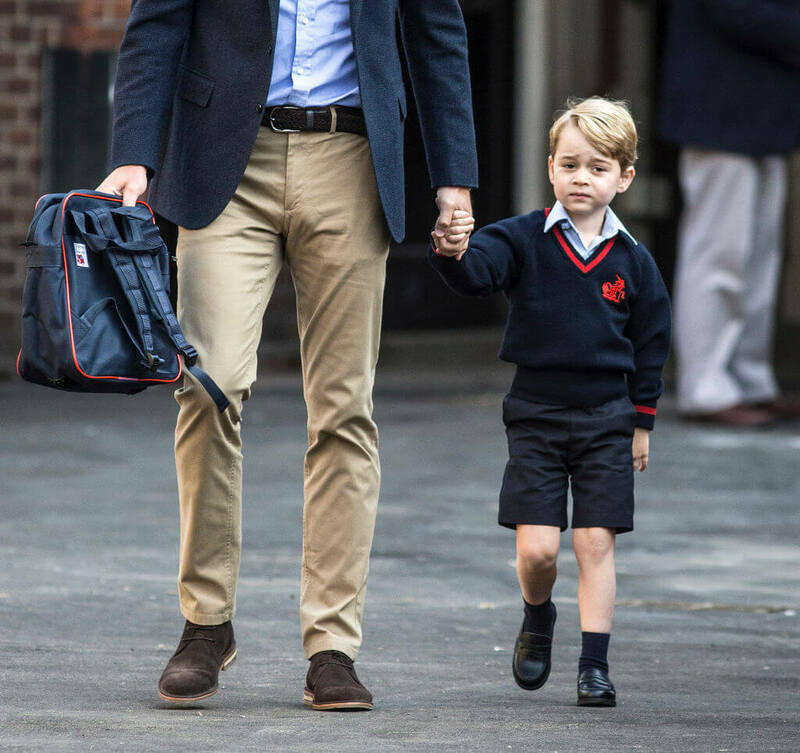 Up next, Prince William made sure George’s first day of school was smooth sailing! Prince George may have been born into the royal family, but there are still certain aspects of his life that aren’t all that different from ours. Here he is, hand in hand with Dad on his first day of school in September 2017. We love this picture because it’s a sweet reminder that sometimes, no matter how grown up kids may seem, they still need their parents around. On the next slide, see how Prince William helped his son overcome some fears he had about flying. 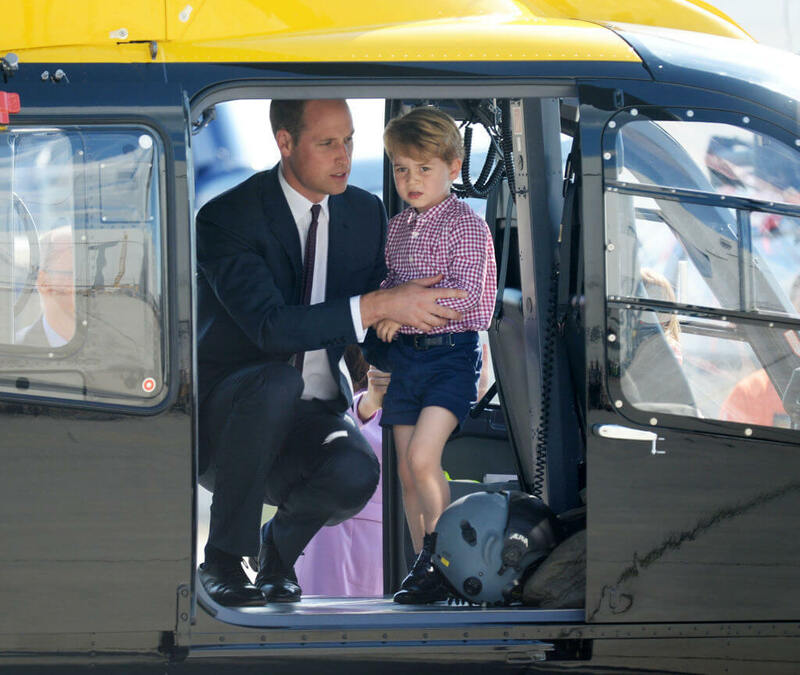 Traveling by helicopter may be a normal occurrence for someone in the royal family, but that doesn’t mean it’s still not intimidating to get inside of a compact aircraft like this. In this photo, Prince William and Prince George are about to depart from Hamburg airport on the last day of their visit to Poland and Germany. By the look on Prince George’s face, he looks a little nervous, but Dad is there comforting him, letting him know they’ll be fine. This adorable photo of Prince William and Prince George was snapped while the father and son were attending Trooping the Colour. The event was held in June 2016 and marked the Queen’s official 90th birthday at The Mall in London, England. We love this picture because you can really see some of the features Prince George shares with his dad. Plus, the way Prince William is sweetly kneeling down next to his son makes us think he’s telling him stories about the past ceremonies for the Queen. No matter how grown up a child thinks they are, there are certain times when their independence takes a backseat and they just want to be carried by Mom or Dad. Prince George looks adorable in his white button-up with red detailing, but by the look on his face, he seems pretty tuckered out. We bet he was relieved Dad was there to give him a lift. While carrying our kids might not always be the best thing for our backs, it’s always sweet when we’re reminded they still need us! Prince William is partially cropped in this family portrait, but it’s just too sweet not to include. This adorable photo was snapped just weeks after Princess Charlotte was born in May 2015. There is so much to love about this image. 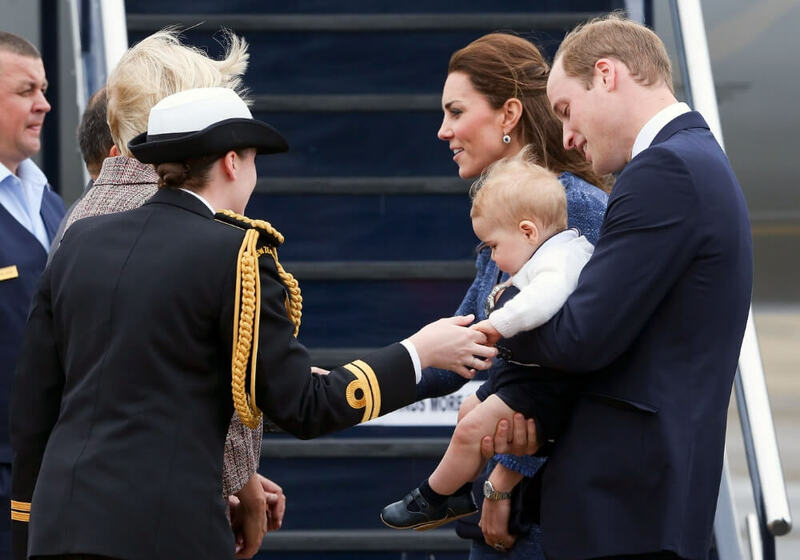 From Prince George excitedly on his tip-toes to peer at his new baby sister, to the sweet way he’s clutching Dad’s hand — it’s too cute for words. 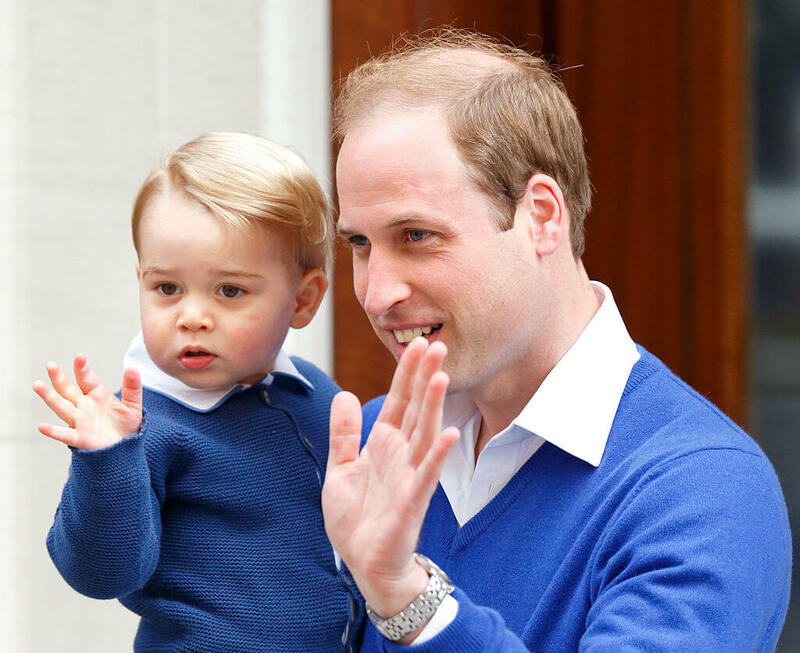 Up next, Prince William shows Prince George how to work the camera for the paparazzi! Life as a royal means you can expect cameras in your face regularly. 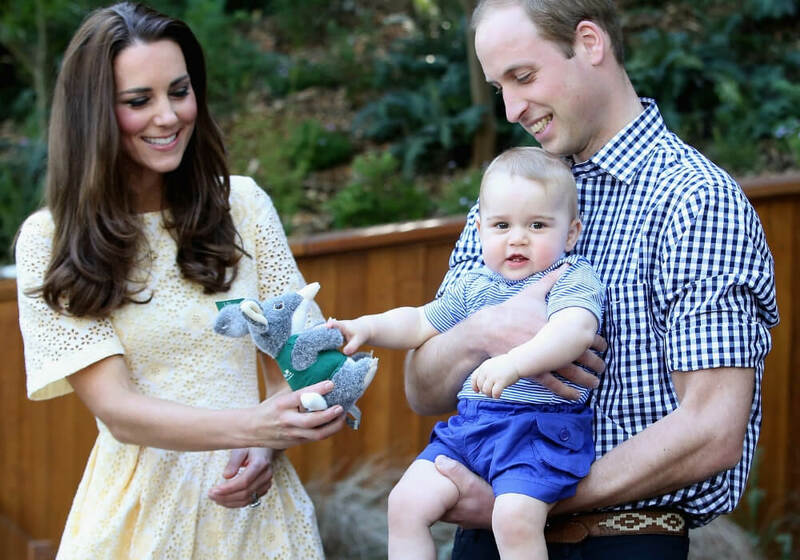 While Prince William is used to being in the spotlight, Prince George is still new to the game. Luckily, he’s got a great dad to show him the ropes — or at least tell him when to wave to the cameras. This sweet photo was snapped as the pair was arriving at the Lindo Wing shortly after Mom gave birth to Princess Charlotte at St Mary’s Hospital. Since Princess Charlotte had just arrived, paparazzi and the press were waiting anxiously outside the hospital. Some might think this photo of Prince William and Prince George is goofy. They were clearly caught off-guard and not exactly camera ready, but that’s precisely why we appreciate this photo of the two so much! Life as a royal tends to pretty stylized and the family goes to great lengths to appear prim and proper, but it doesn’t always make them feel relatable. This candid shot of the boys getting ready to meet Mom and Princess Charlotte at the hospital is real — and that’s what makes it so sweet. Sometimes the sweetest photos of parents and their kids aren’t ones snapped by a professional. We love this photo because it’s candid and we can really see the raw emotion as Prince William was navigating the world of parenting his first newborn. 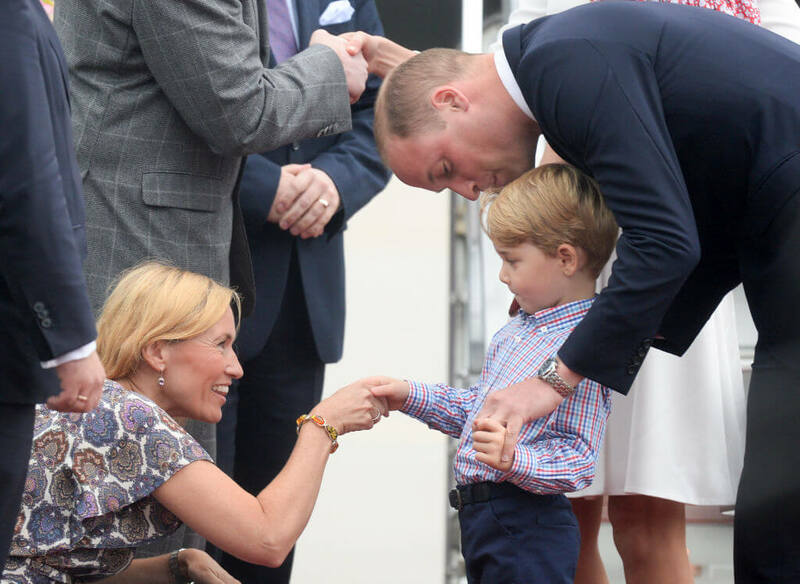 This moment is especially sweet because Prince William looks so proud of Prince George. He was clearly excited to be introducing his son to the Royal Australian Air Force. The look on his face says it all — he’s one proud papa! Who knew Prince William was so funny? By the look on his son’s face, he’s a comedian! 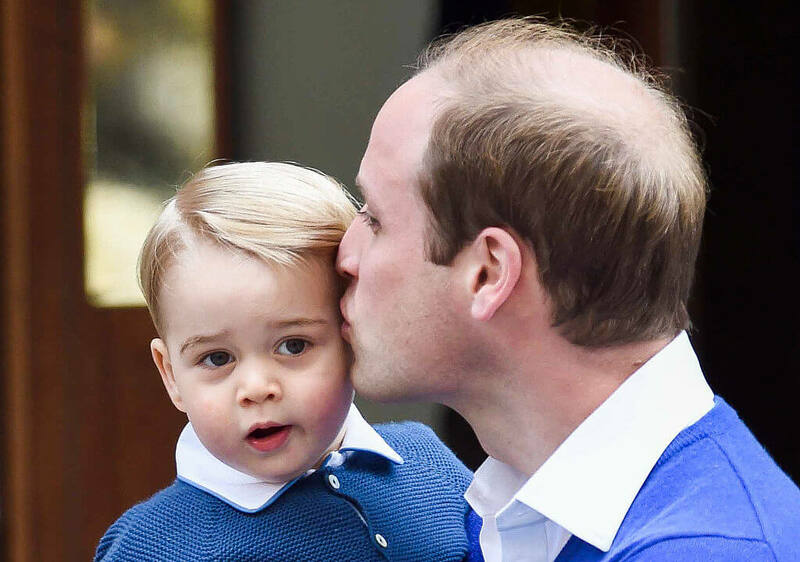 Or maybe Prince George just loves his dad so much that he thinks everything he does is the best. We’re not sure what exactly Prince William was saying to his son when this photo was snapped, but one thing is for sure — these two share a strong bond! 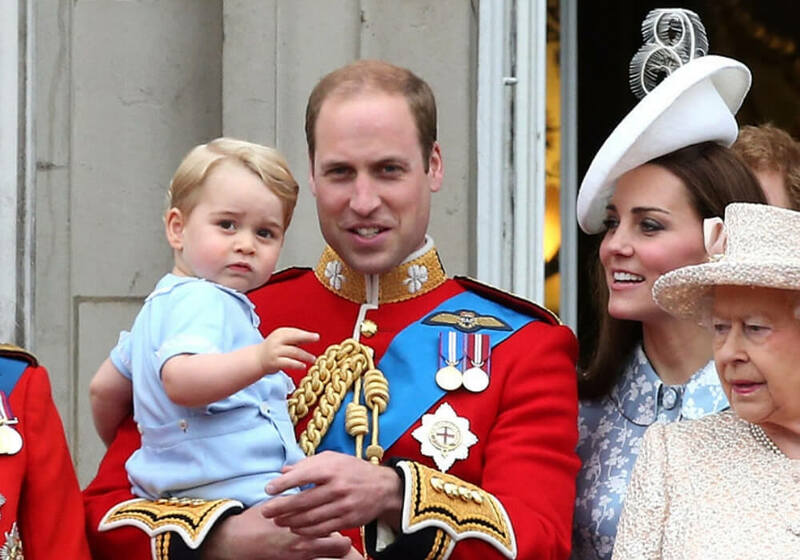 Up next: see a sweet photo of Prince William and Prince George celebrating the Queen’s 90th birthday. Being a royal means celebrating in style, especially when it’s the Queen’s birthday. Here, Prince William is lovingly holding Prince George while the duo stands next to Kate and Queen Elizabeth during the annual Trooping The Colour ceremony. The ceremony is hel each year in June, marking another year around the sun for the Queen. This year, in particular, she celebrated turning 90 years old! See adorable photos of Prince and William and Prince George at the Natural History Museum next. It’s easy to become jaded once you’re an adult, but when you have kids, you truly get to experience things for the first time again through the eyes of your child! 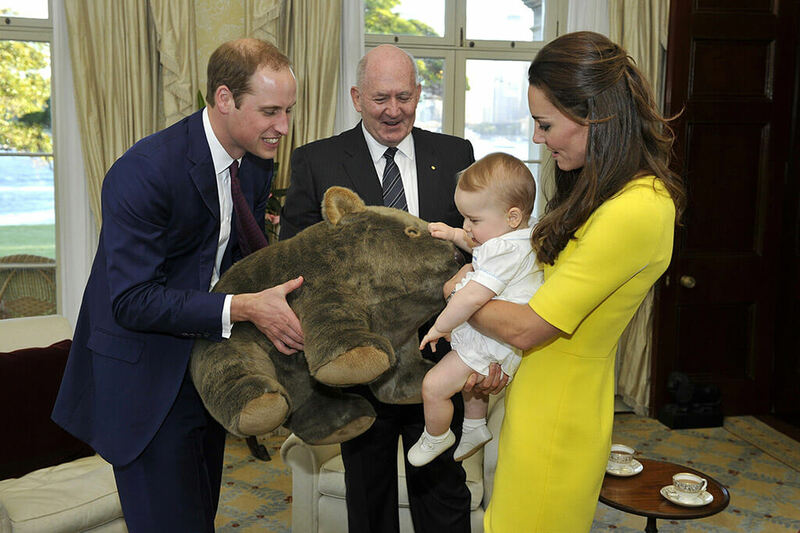 In the summer of 2014, Prince William and Kate took Prince George to the Natural History Museum in London. 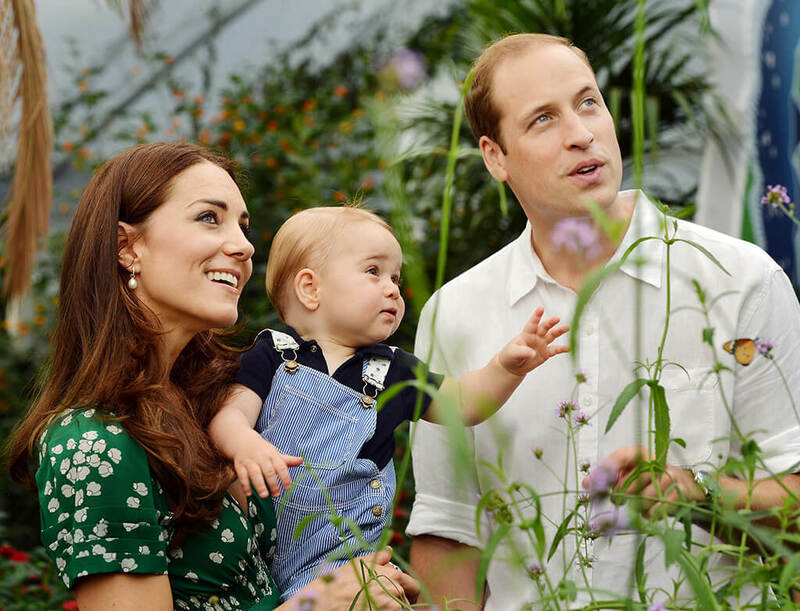 Here they visited the Sensational Butterflies exhibition and it’s clear to see George was in awe! This trip was even more special because it was in celebration of George’s first birthday. 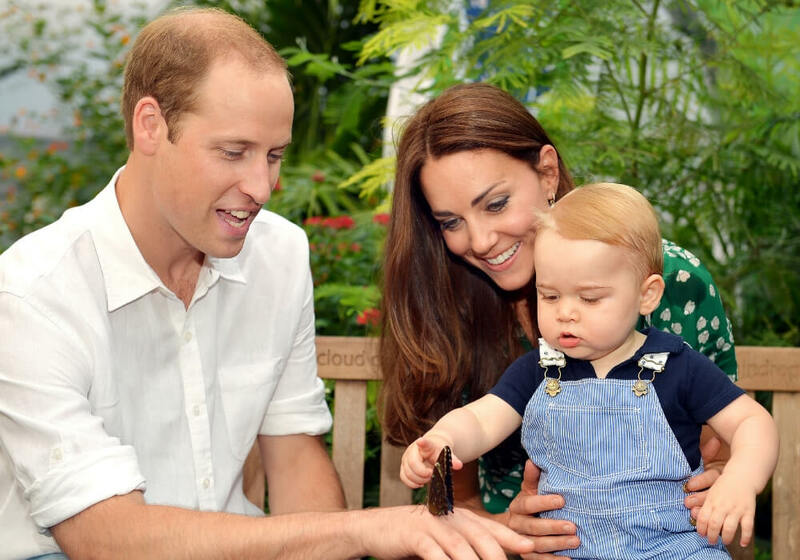 How cute is this photo of Prince George when he was just a baby? 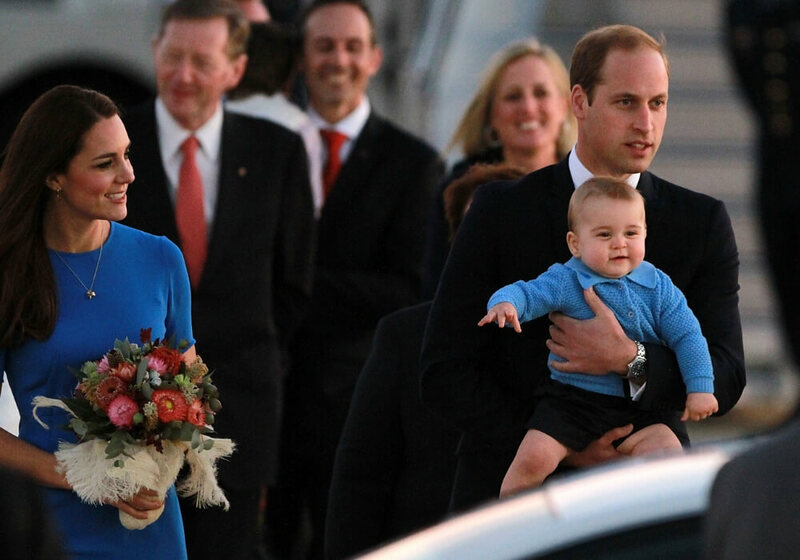 Here he is, smiling, safe in Dad’s arms as the royal family arrived at an airport. Prince William clearly appears ready to meet their guests and, by the looks of it, can’t wait to introduce the bunch to his bundle of joy. In our opinion, there are few things more precious than a proud father! Take a look at the family’s trip to the zoo next. 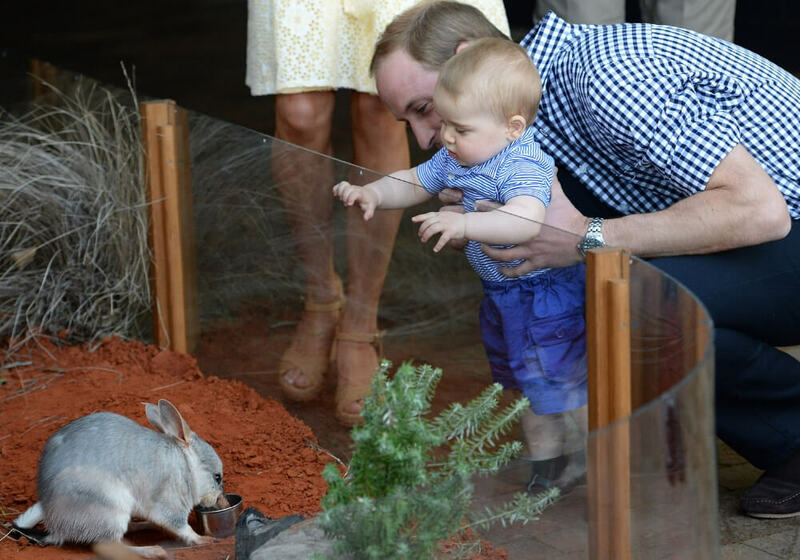 How cute is this photo of Prince William helping Prince George see into an animal enclosure? This adorable picture was snapped while the royal family was visiting the Taronga Zoo while on a three-week tour of Australia and New Zealand back in 2014. As you can see, Prince George is just a baby and was still an only child at the time. 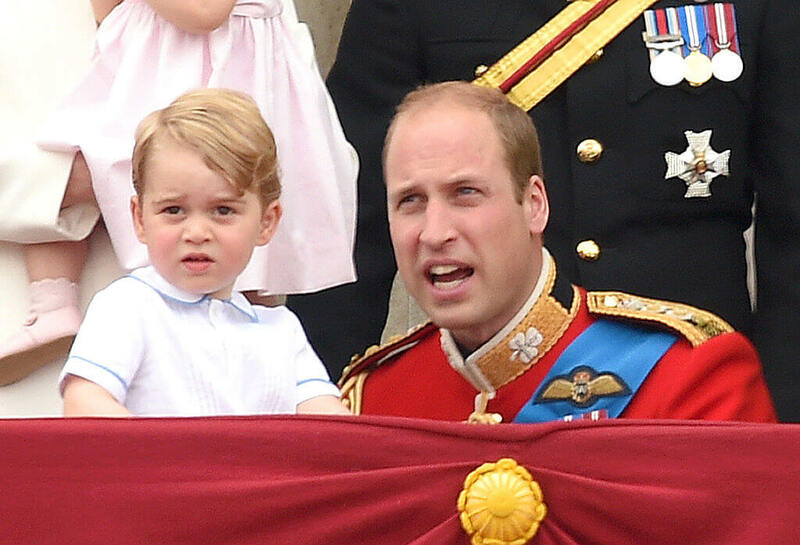 We love this photo because of look of wonder Prince George has in his eyes. Dad is clearly excited to be showing his son something new! This sweet shot was taken while the Prince William, Kate, and then-infant George were attending a tour at the zoo while in Australia. At the time, George was just nine months old. What makes this even sweeter is that Prince William was the same age as his son when he traveled down under with Prince Charles and Princess Diana in 1983. While at the zoo, Prince William carried George around and made sure he was able to see into all of the exhibits. The young Prince even got to meet a handful of exotic animals. 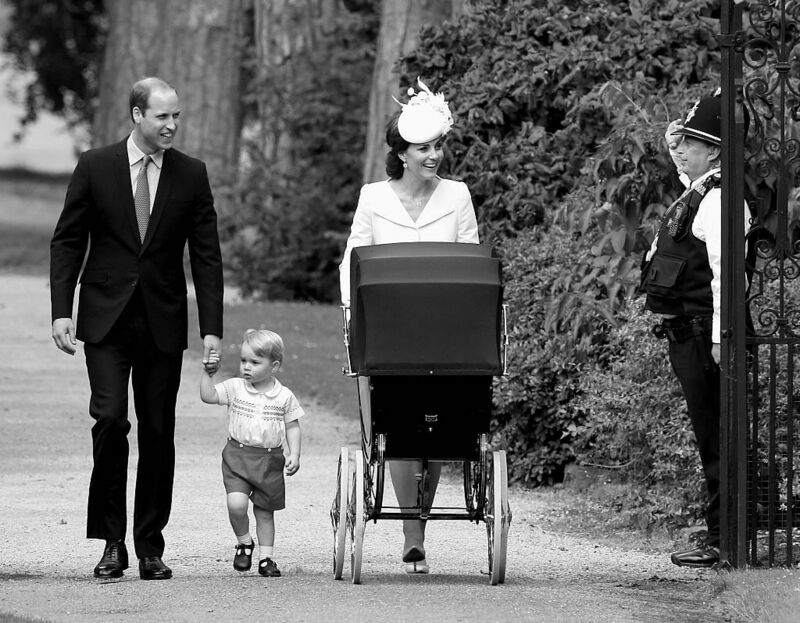 How cute is this black and white portrait of the royal family? Snapped just weeks after Princess Charlotte arrived, Prince George was taking his new title as “Big Brother” very seriously. While he may feel all grown up, it’s still sweet to see him walking hand in hand with Dad. It’s always nice to be reminded that our kids still need us every now and then, even when they’re growing up right in front of our very eyes! Here, Prince William seems to be comforting his son after sitting through the Trooping the Colour parade at Buckingham Palace. It can’t be easy for little George to have to remain calm and act appropriately at such events, especially when it’s obvious that he would rather be doing something else. Surely, Prince William is letting him know that he did a good job and that he’s proud of him, especially since he can sympathize, for he was in George’s position at one point. 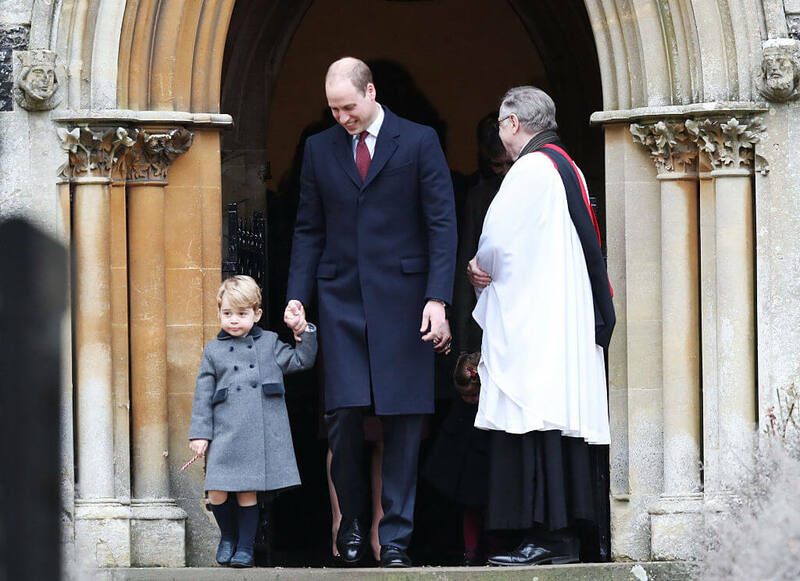 This adorable image was captured as Prince William and George are exiting St. mark’s Church after Christmas Day service in Englefield, Berkshire. Surely, George is relieved to finally be leaving, and is most likely thinking about the presents that are waiting for at home. It looks like he even manages to get a candy on his way out of the door, which will hopefully keep him preoccupied until he gets home. His little pea coat and shorts are just too cute! The family was visiting Canada on an eight day visit to the country, visiting numerous different areas. It’s clear that George seems relatively comfortable at this point, and even knows when it’s appropriate to wave. 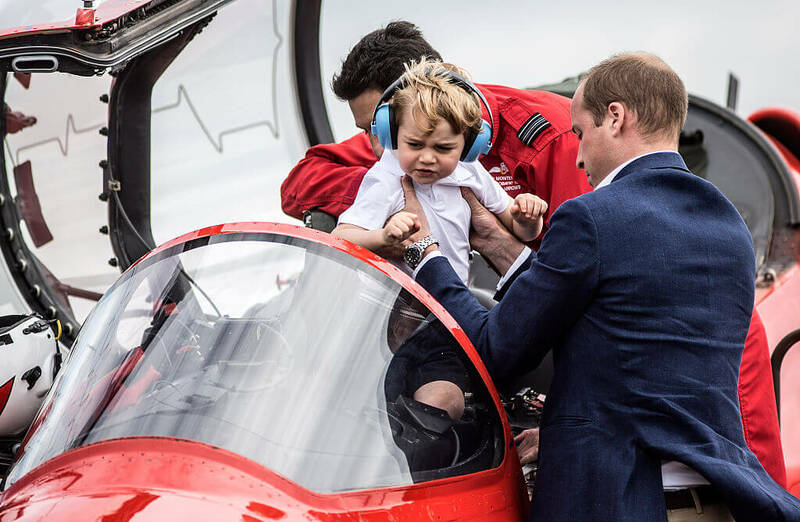 While visiting the Royal International Air Tattoo at RAF Fairford, it looks like Prince George is teaching his father a thing or two about aircraft even though his dad was once a pilot. We hope that Prince William is taking notes, but we’re that that whatever George is telling him is probably some valuable information. You can see by how involved Prince William is in the conversation that he really does care about what his son has to say, no matter how old he is. Here, Prince William steadies George as they prepare to depart Victoria, Canada by sea plane after their visit to Canada. 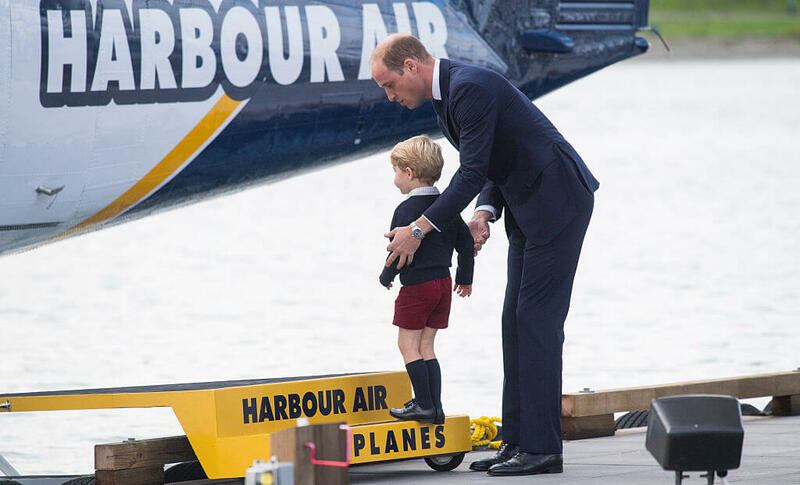 It looks like William feels that George is old enough to board planes on his own, even if there’s a plank without any railing. However, that doesn’t mean he isn’t going to give him a little help along the way. He seems cautious yet confident in his son’s ability to cross the platform, preparing him for something he’ll most likely do countless times in his life. In this photo Prince William is participating in the Gigaset Charity Match at Beaufort Polo Club on June 14, 2015. Of course, William had to head to the sidelines to visit his son and wife that were proudly cheering him on during the match. 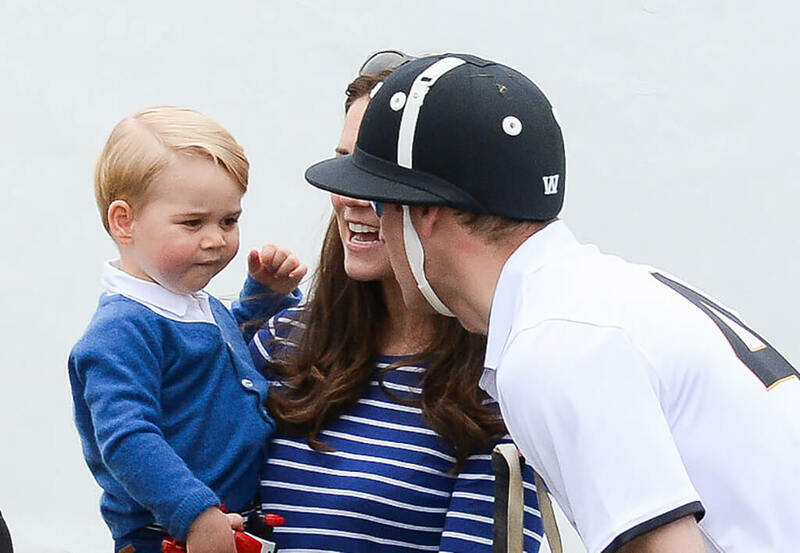 While George may not know very much about polo yet, we’re sure that he’ll be in his father’s shoes someday to represent his family at charity matches. At least he has a toy to preoccupy him. While in Sydney, Australia, Prince William leans in to give his son a kiss on the head while at the Taronga Zoo. 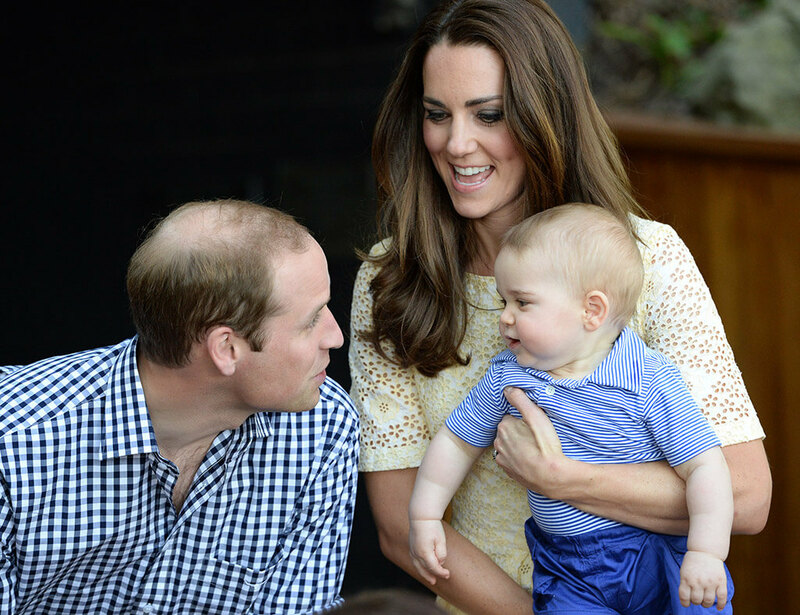 Hopefully, prince William is cherishing these moments while he can before George grows “too old” for them. Especially if people are going to be taking pictures of them. 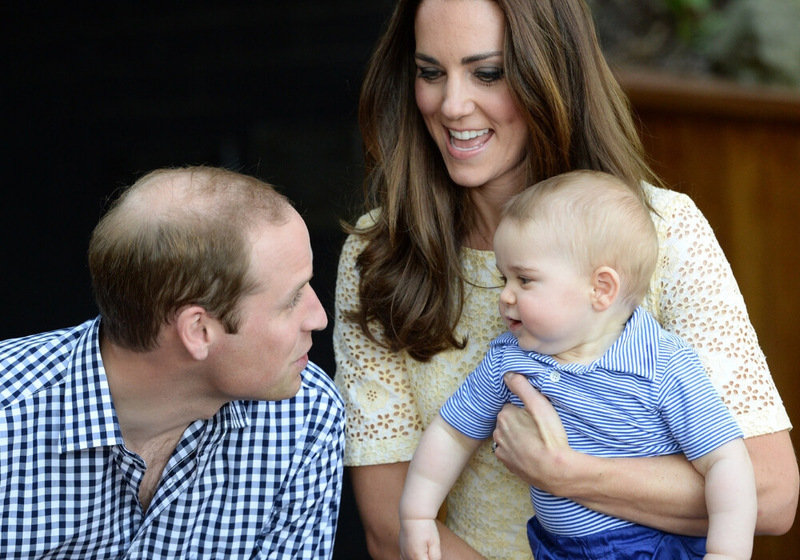 Royal or not, a teenage prince George probably won’t appreciate pictures of his parents babying him once he grows up. At least we get to see them now before it’s too late. 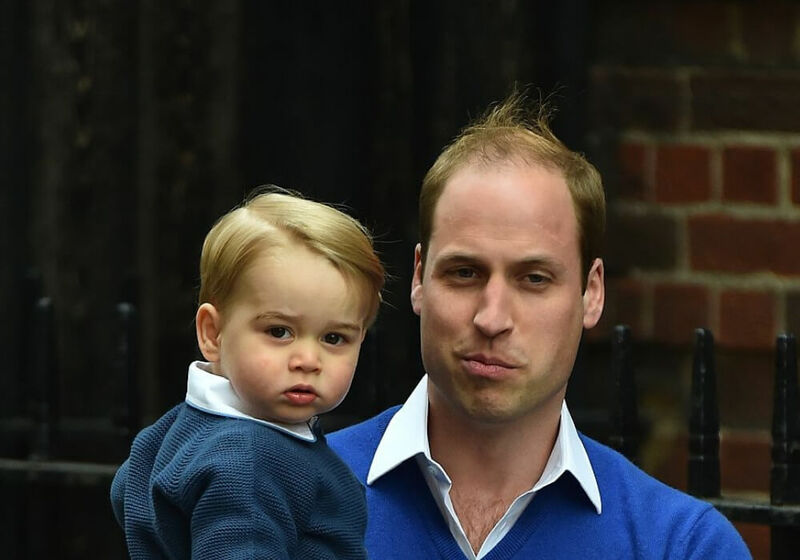 Prince William looks at George and George is looking right back, clearly knowing his father is. Even though George is incredibly young in this picture, it shows the bond that they already share before George is even old enough to speak or walk. The royal family is lucky to have personal photographers so that moments like these are captured for both the couple as well as the public. They look like a truly happy family in the picture. 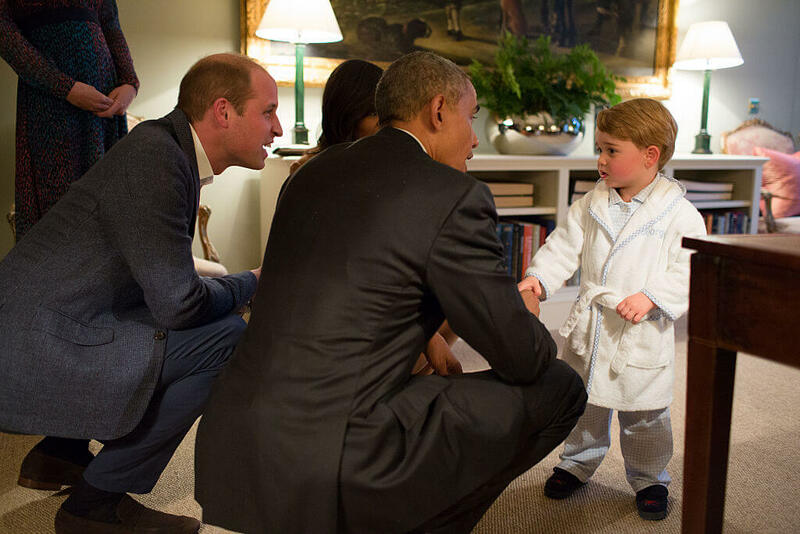 We don’t think that there’s anything cuter than Prince George in his pajamas with a robe, looking to his father for guidance as meets former President Obama. We’re sure the former president just melted when we walked in the room to find George looking this adorable. Obama was visiting the UK when this picture was taken where he attended lunch with HM Queen Elizabeth II at Windsor Castle and later dinner with Prince William and his wife Catherine. Here, prince William and George attend a children’s party for military families during the Royal Tour of Canada. George wraps his arms around his father’s neck most likely because it makes him feel more comfortable in a situation that is most likely incredibly stressful for a boy his age to be in. Prince William appears to be comforting him, understanding that it must be hard. We sure hope that George made some friends his age at the party! George and his father look at the butterflies together while visiting the Sensational Butterflies exhibition at the Natural History Museum in London, England. This particular photo was released by the family just before George’s first birthday. Looking at this image, it’s clear that Prince William is George’s father. The two look very similar as well as equally amazed by the butterflies at the exhibit. Maybe George will take his own children to the same exhibit when they’re older and they can re-create the picture. Even though Prince George is a member of the royal family and has certain expectations to uphold, it’s important to remember that he is a little boy at heart. This what is what makes this picture so precious. this image was a handout supplied by Admiralty House, the official residence of the Governor-General. The Governor-General Sir Peter Cosgrove presents a young Prince George with a gift, which his father playfully shows to him. Although the stuffed animal is bigger than he is, it’s sure to come in handy at some point during his childhood. 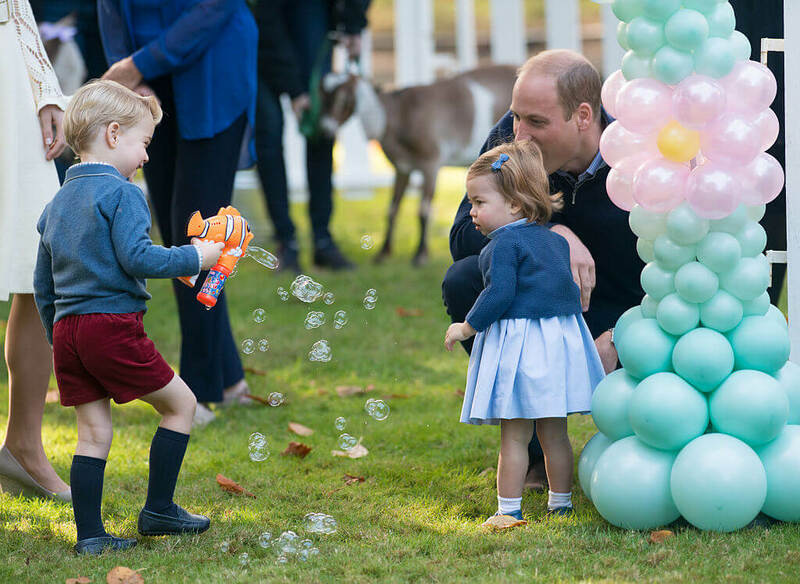 The picture also shows that Prince William is no amateur when it comes to playing with his son and knows exactly how he’ll react to the gift. On October 23, 2013 in London, England, Prince William arrives holding Prince George at Chapel Royal in St. James Palace, just before the Christening of the three-month-old boy. 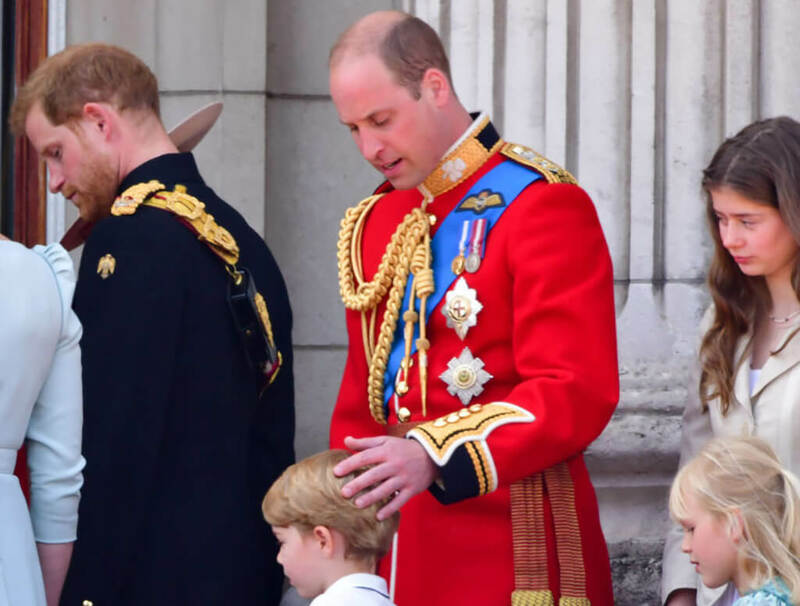 Although George may be clueless as to what is happening, William knows that this is a very big day not just for George, but for the entire royal family as a whole. You can see how proud he is as he arrives to the Chapel Royal. 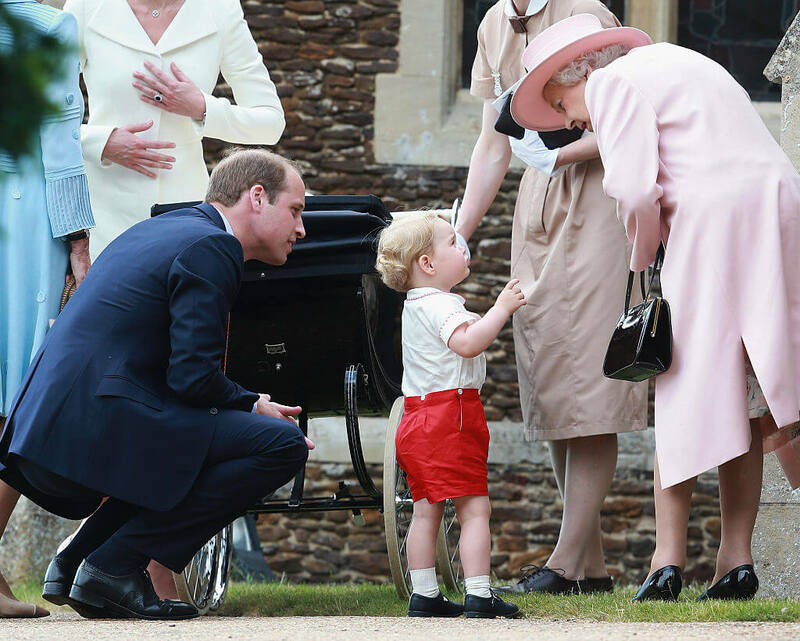 Prince William watches closely as a young Prince George interacts with Queen Elizabeth II outside of St. Mary Magdalene on the Sandringham Estate. 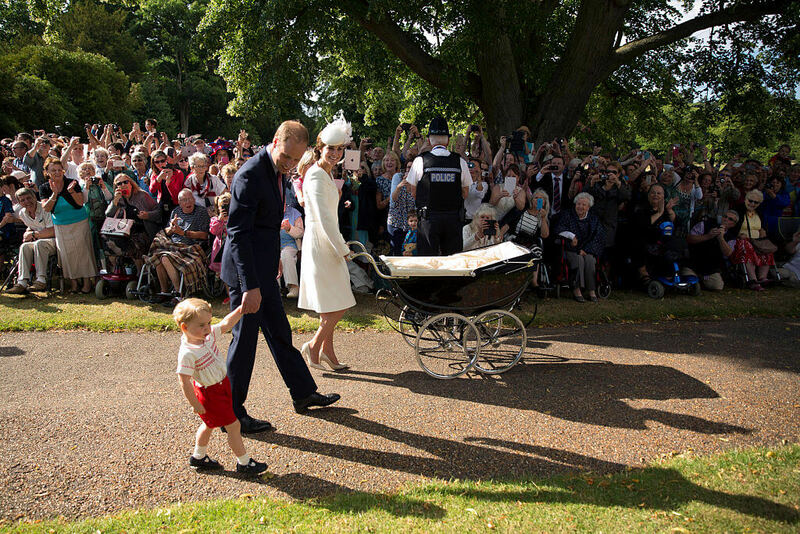 They are here for the Christening of Princess Charlotte of Cambridge on July 5, 2015, in King’s Lynn, England. You can tell that Prince William is a proud father, and it’s safe to assume that having a prince running around as cute as George melts Queen Victoria’s heart. One can only wonder what they are talking about. The funny thing about this picture is that Prince William looks just as amused as George watching the magician at the children’s party in Canada in 2016. It’s clear to see where Prince George gets his curiosity from, as his dad looks to be having just as much fun. 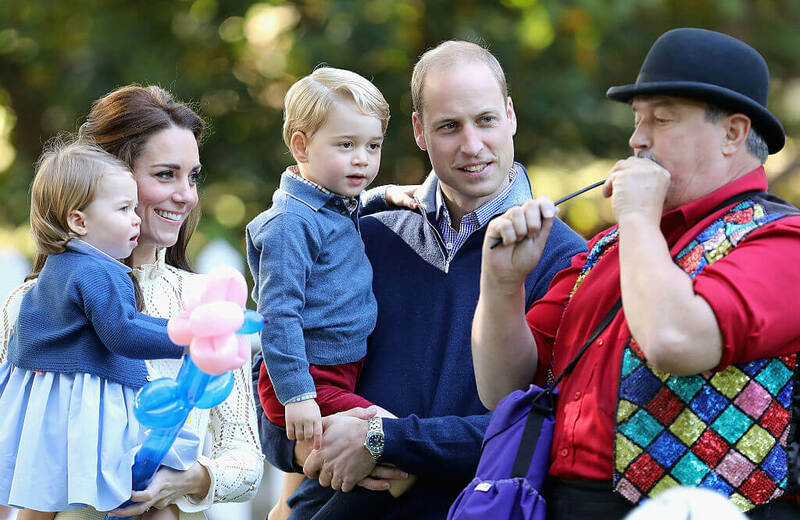 Prince William is also holding George at the perfect level so he won’t miss anything that the magician is doing. Maybe he’ll get into magic himself! 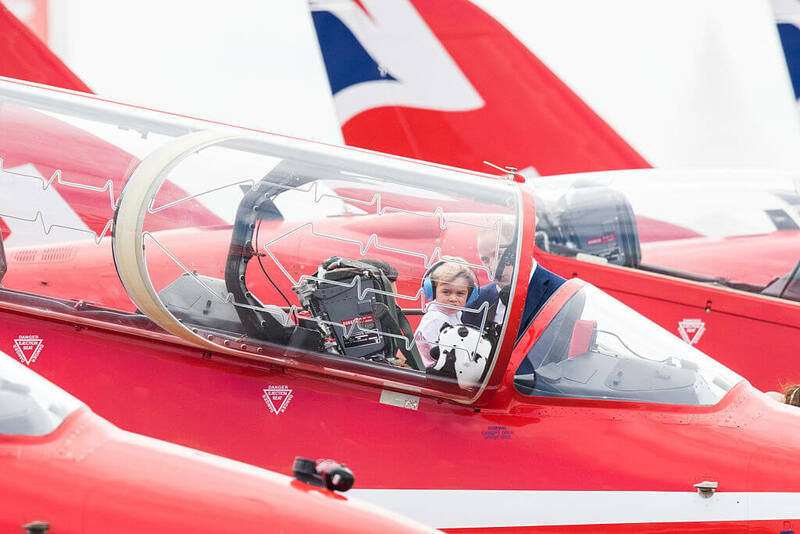 While visiting the Royal International Air Tattoo at RAF Fairford, Prince William and a pilot help to load Prince George into the cockpit of a red arrows plane. This is most likely something that most people don’t have the opportunity to do, so we hope that George enjoyed it while he could! Who knows, maybe he’ll take after his father and become a pilot when he grows up. He already has a leg up on others since he’s already sat in a cockpit before. 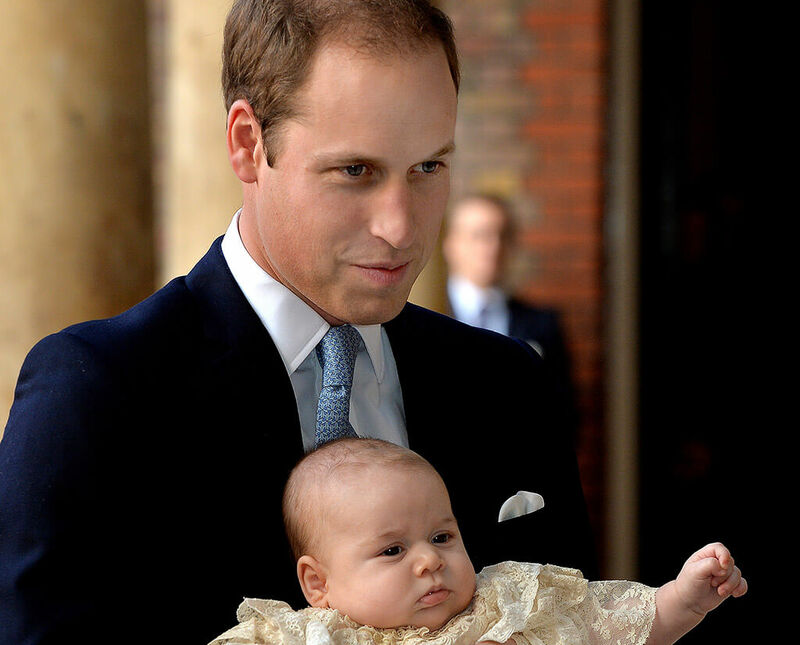 As the royal family arrives at the Church of St. Mary Magdalene for the Christening of Princess Charlotte, Prince William holds tightly onto his son as they walk in the procession. Surely, it must be quite strange to walk with your family with so many people taking pictures and cheering your name. 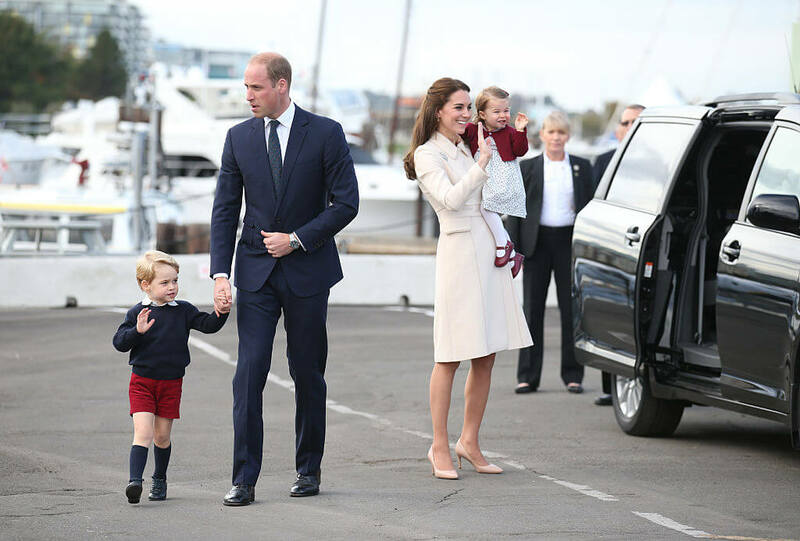 It looks like George is distracted by something and is tempting to stray from the path, but Prince William is there, making sure he keeps walking forward. 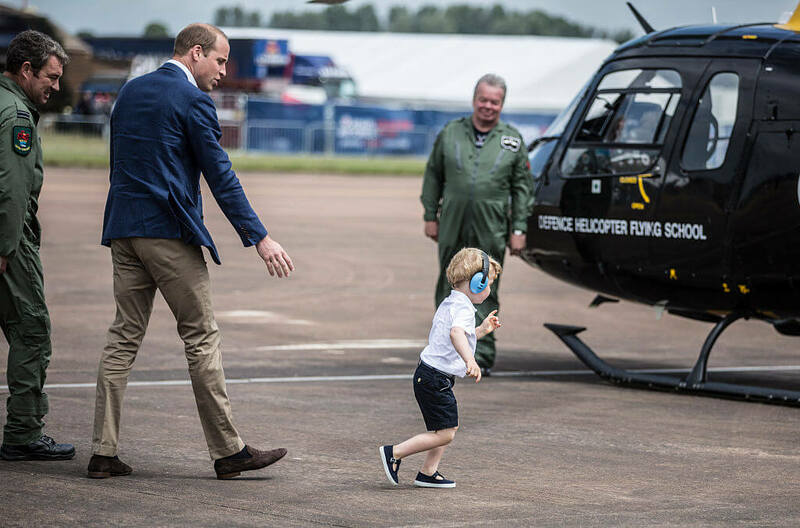 Prince George makes a run for it as they are looking around a “Squirrel” helicopter, an aircraft that is something similar to the one that Prince William trained on. While George is expected to remain well behaved, you can’t blame him for running away from his parents every now and then just like any other little boy. We’re sure that he became overly-excited with all of the helicopters and had to get some of his energy out somehow. In this image, Prince William and Prince George arrive at the Warsaw Airport during an official visit to Poland and Germany on July 17, 2017. 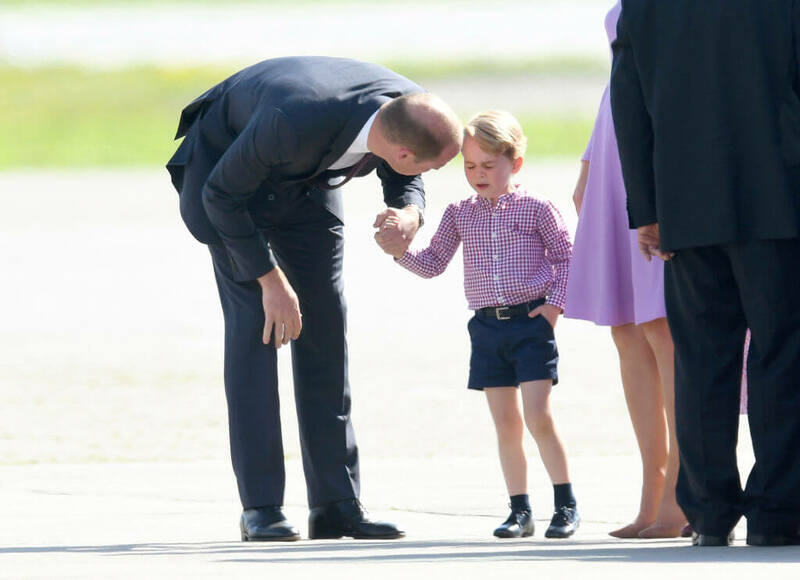 It appears that Prince William is still coaching George on how to properly greet people, something he will be doing for the rest of his life. It’s clear that everyone loves watching George try to master these complicated formalities and try to help him the best they cab at the same time. Shaking hands with Prince George is sure to make anyone smile.